Thank you to everyone who has made the launch week of our Jedediah Pants such a success! It has been very exciting to see so many people inspired to sew menswear. To encourage this inspiration, I am happy to announce that Sarah, of Fabric Tragic, has cleverly declared August to be “Making for the Man” month. She ambitiously plans to join in on the Jedediah Shorts Sew-along on August 15th, sew Colette’s Negroni shirt, and a t-shirt…all for her very lucky husband! 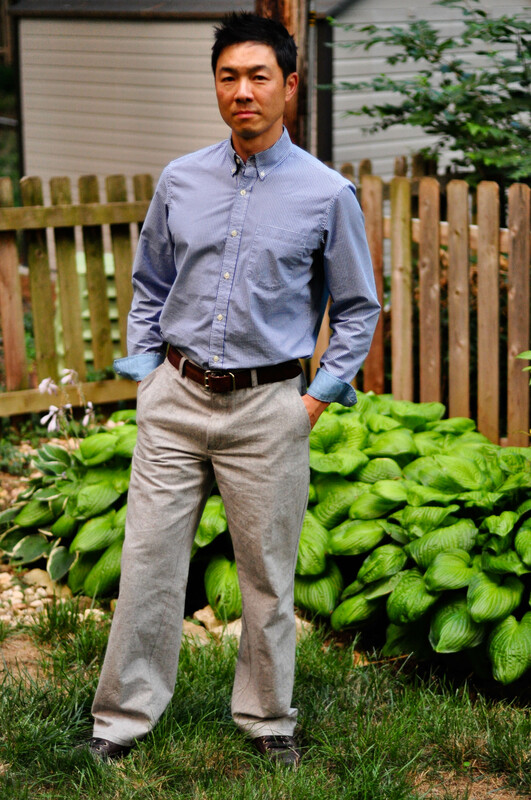 I’m eagerly taking part in Making for the Man by sewing up Matt’s new blue twill shorts for the sew-along and a sample of the Strathcona Henley (which we are working very hard on at the moment!). I think my list will have to stay at just the two garments for now as making the initial sample while writing the instructions for a new pattern always takes such a long time. Matt and I picked out some fabric for the Strath today – I will post about it next week! Here is one of my inspiration boards from months ago – I can’t wait to get sewing this! Now, back to the Jedediah Pants, we have the highly anticipated results in from two of our test sewers – and they are GREAT results! 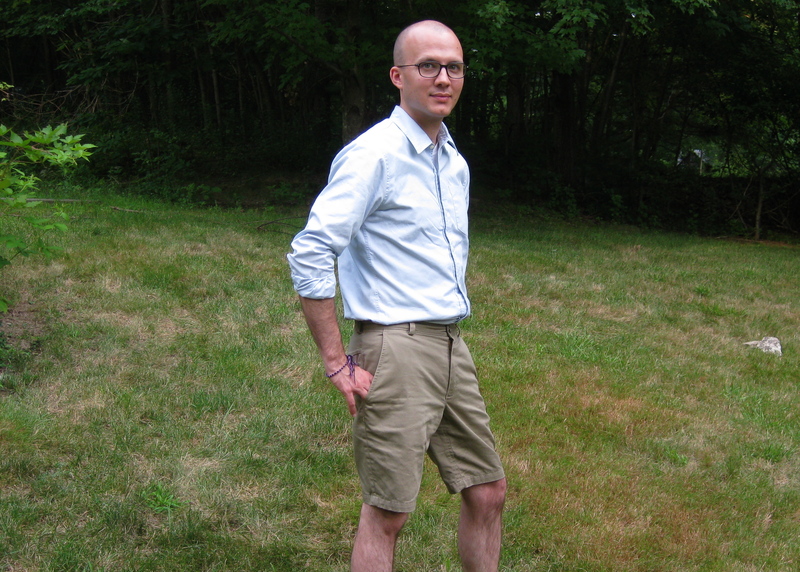 Lisa G. of Notes from a Mad Housewife sewed up some really classy twill shorts for her husband and did a spot-on job of top-stitching. She posted a great, in-depth review of the Jedediah Pants pattern on both her blog and Pattern Review. She also has a very relevant tutorial on How to French Seam Pocket Bags that will be an excellent visual to use when you are ready to complete that step in the Jedediah Pants instructions! Thank you, Lisa, for your excellent pattern-testing services! 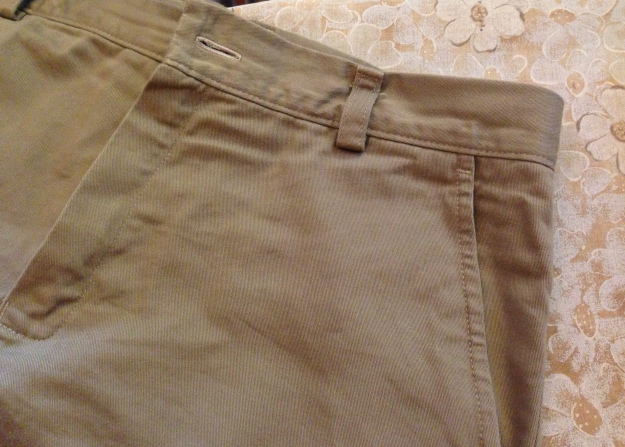 Lisa G of Notes from a Mad Housewife’s cotton twill shorts. Perfectly “casual with a dressy edge”! Lisa’s addition of top-stitching along the slash pocket edge is a great idea and will make the pockets even harder-wearing. Katie, of Creative Counselor sewed her version of the Jedediah Pants in a gorgeous recycled hemp and organic cotton blend (drool!). She did a thorough job of mocking up the pattern and adjusting the fit of the legs to exactly match her husband’s vision of the perfect pants. It is great to see the Jedediah Pants turned into a boot cut – they look great and it shows how, while the fit of the waist and seat is still the same, a simple adjustment to the leg width can create endless style variations! You can read Katie’s review of the pattern here. Katie of The Creative Counselor’s recycled hemp and organic cotton pants. She has altered the leg width to create boot-cut pants! A great fit – and great fabric! In celebration of the Jedediah Pants pattern release this week I have made up a quick visual tutorial explaining how to lengthen and shorten the pant leg pieces of the pants to help you along the way to a totally custom fit. 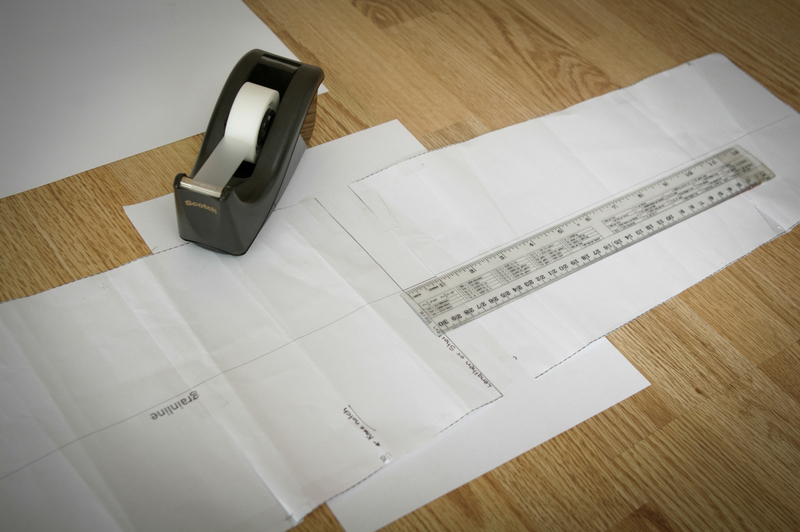 This process would apply to any pattern that needs adjusting! 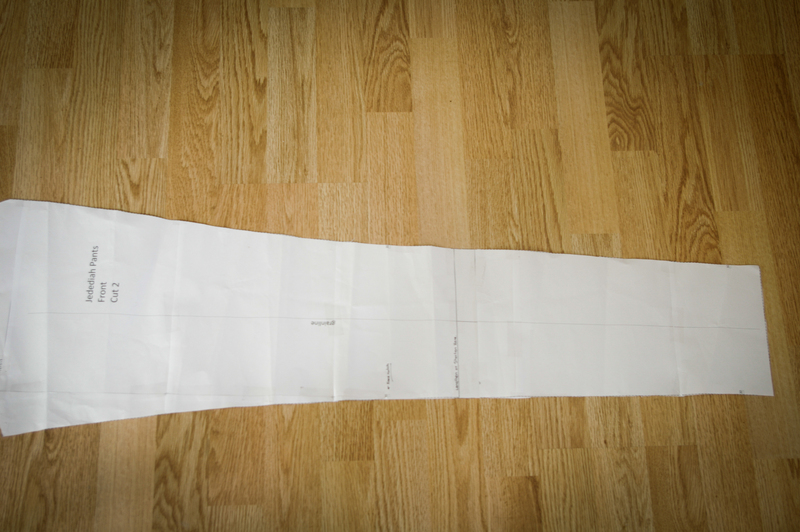 1) Determine how much length you need to add or subtract from your pattern by measuring the wearer (their inseam, their back length, their arm length or whatever area you are concerned will need adjustments) and comparing this measurement to the body measurements included in the pattern’s instruction booklet. 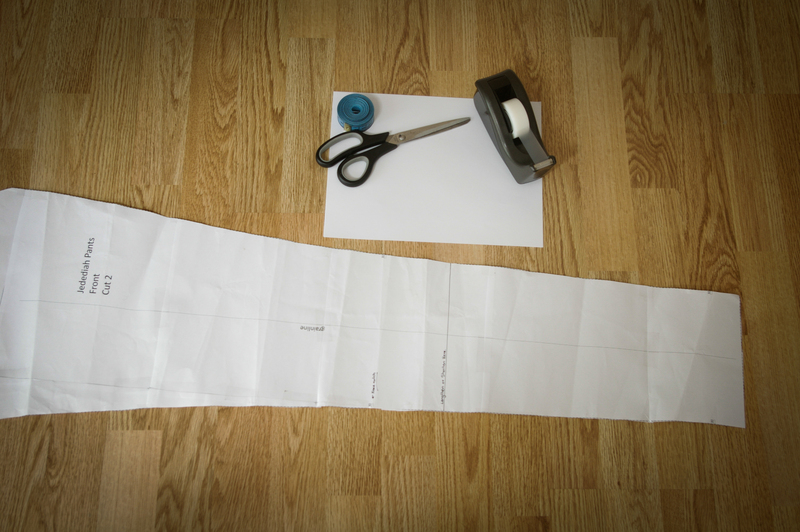 If the wearer’s inseam is 34″ for instance, while the pattern has a 33″ inseam (despite the fact that they fit the waist measurement), then you will need to lengthen the pattern by 1″. 2) If your pattern includes a “Lengthen or Shorten Here” line, simply cut along this line, separating the pattern into two pieces. 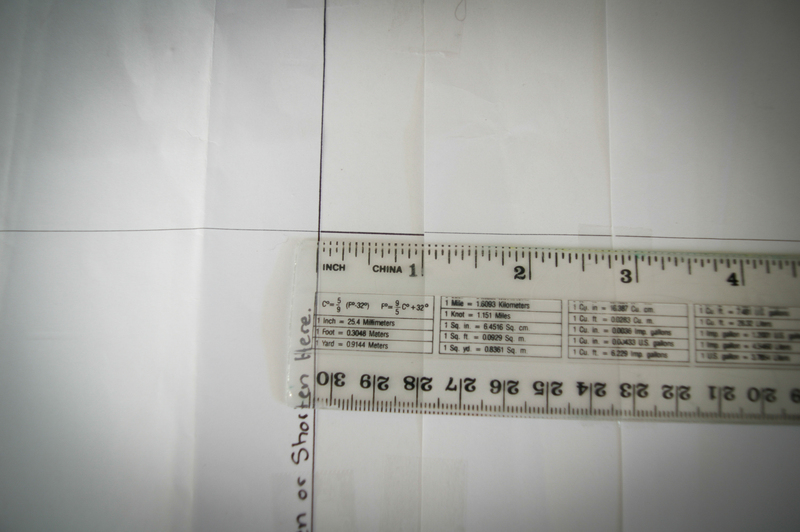 If you have not been given this line, you can make your own by using a ruler to draw a horizontal line along the part of the pattern with the least amount of flare or taper. 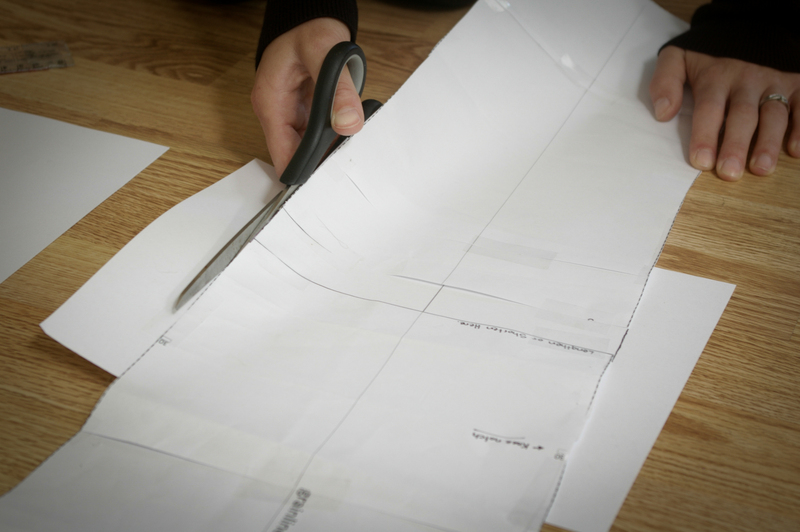 Make sure, if lengthening the body of a garment, to lengthen all corresponding facings and plackets so that the pattern pieces will still fit together later on in the sewing process. 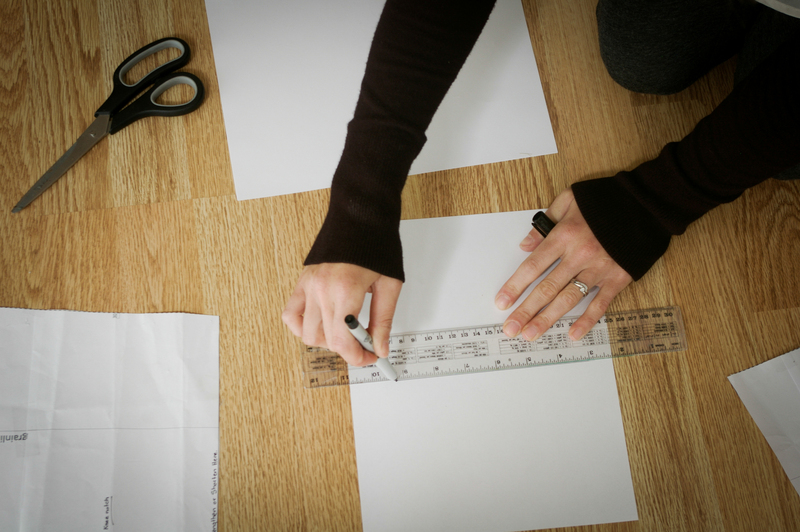 3) For Lengthening: Using a ruler or other straight edge, draw a line on your blank piece of paper or tissue so that you can use it as a guide to extend the grain line and thus ensure that your two pieces are being lined up correctly. For Shortening: Overlap your two pieces the amount you determined in Step 1 and line up the grain line so it forms a straight line. Draw a ‘grain line’ onto your blank piece of paper or tissue. Lay the paper down with the pattern pieces on top of it and line up the pattern’s grain line with the one that you drew. The grain line that was drawn on the blank piece of paper (now underneath the two pattern pieces) is lined up perfectly with the grain line of the original pattern piece. The gap between the two pattern pieces measures 1″. 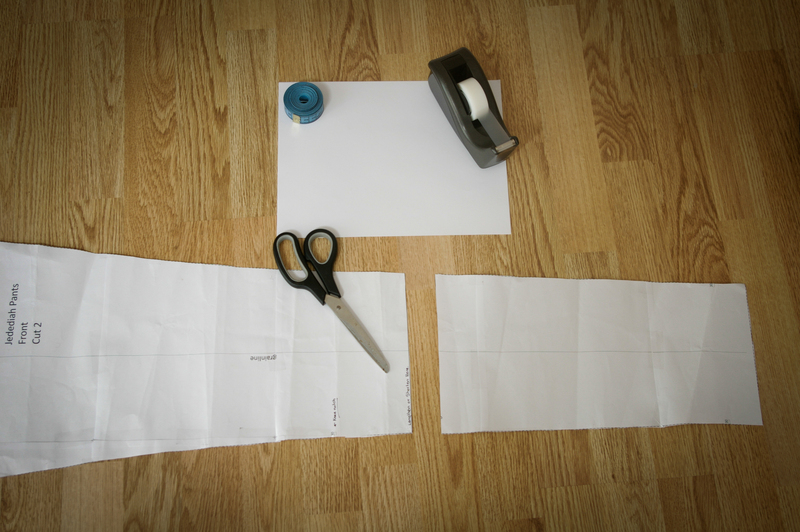 Step 4) Tape your pattern pieces down to the paper (or, if shortening, to each other) and blend the curve or straight edge to connect either edge of the pattern. Cut off the excess paper. Cut off the excess paper. Make sure to blend the new edge smoothly. 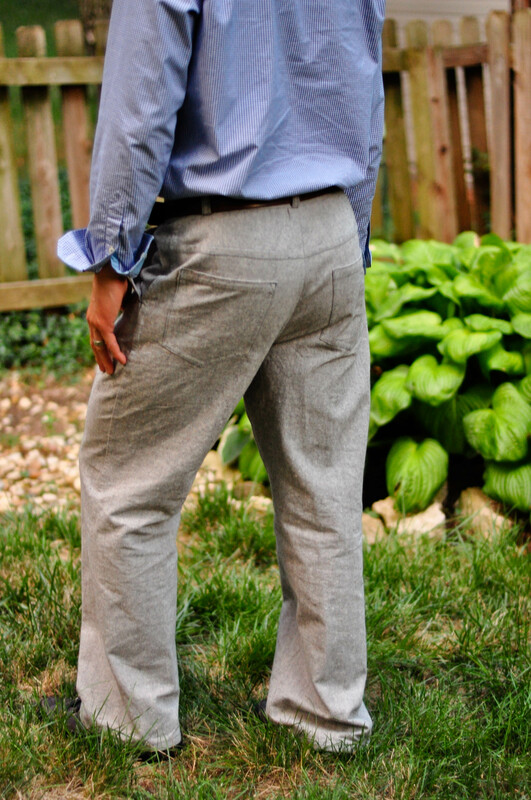 Your lengthened pant leg – 1″ longer than before! Categories: Friday Posts, Jedediah pants, lengthening and shortening patterns, Tutorials | Tags: tutorial | Permalink. Nice to see the testers’ finished projects. Now it’s our turn! Yes it is! 🙂 I hope you enjoy sewing them! Glad launch week went well! Since I have two more pairs in the works, I just might join in on Making for the Man! Ha ha my husband is thrilled – I’m locked in now! Thanks for the shout -out! glad to hear your pattern launch was a success! 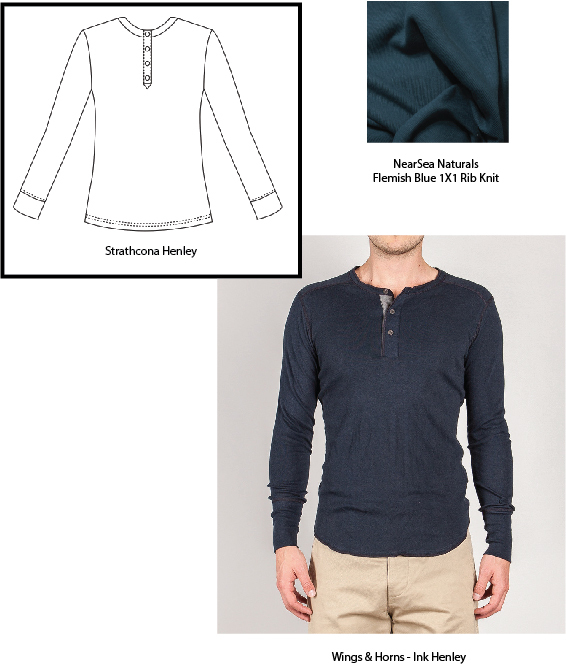 that henley will be perfect for fall… and for stealing from my husband’s closet!